Oh. my… This PIE. This is my new favorite! Hi again! It’s your pie-making friend, Emily, from PrettyPies.com. I have made literally dozens of desserts over the past couple of years, but *this* one definitely ranks high on my list. It’s SO simple. And so delightfully delicious! I can’t wait to share the recipe with you! You will love how incredibly easy it is to make. Just 7 ingredients and a few minutes is all you need! No baking, no food processor, nothing fancy. The best part? NO waiting for hours for it to set. You can enjoy right away! 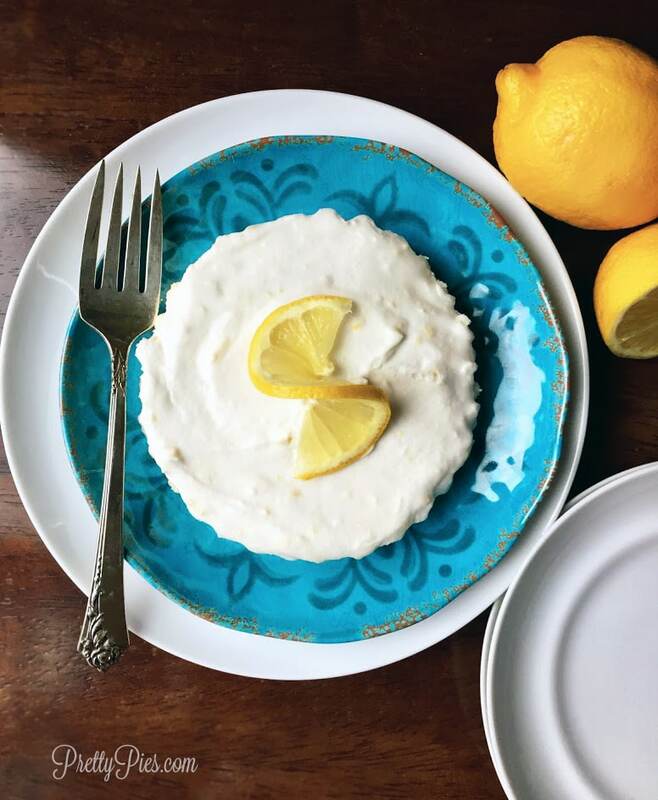 Unlike conventional lemon cream pies, this one is made entirely from healthy whole foods. No gluten, grains or refined sugar. Just coconut flour, water, coconut oil, coconut milk, lemon, maple syrup and vanilla. That’s it! This pie has a soft, cake-like crumb crust and fluffy lemony cream piled on top. 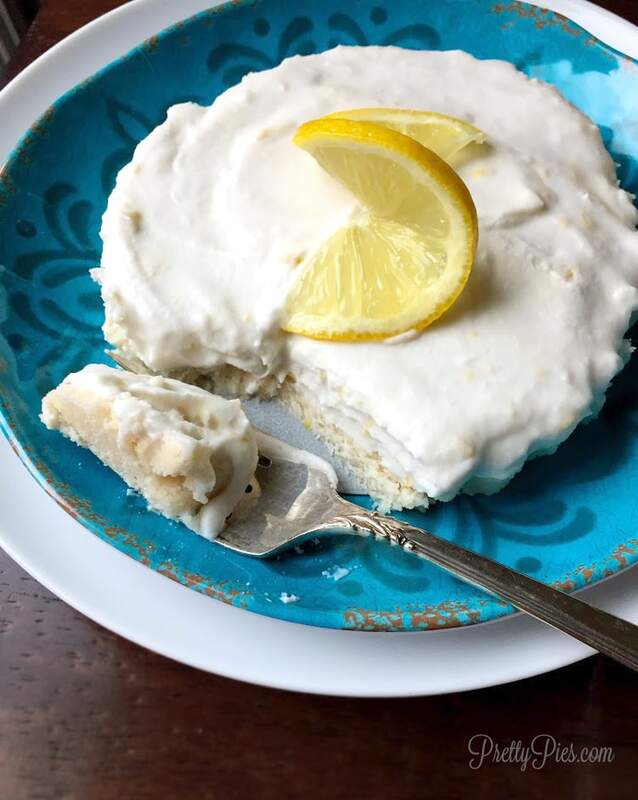 I seriously can’t get enough of this lemon whipped cream. So refreshing and light. To me, it’s the perfect after-dinner treat. Bonus: there’s only 3 Tbs of sweetener in the entire recipe! Coconut has a sweetness on its own, so it doesn’t need much. I used mini tart pans make these pies. They’re the perfect size for a dessert for two. (But no judgement if want to keep it all for yourself. lol I could totally polish off the whole thing.) This recipe makes 2 super cute mini pies (4 servings total). You can double it to make a standard size pie. 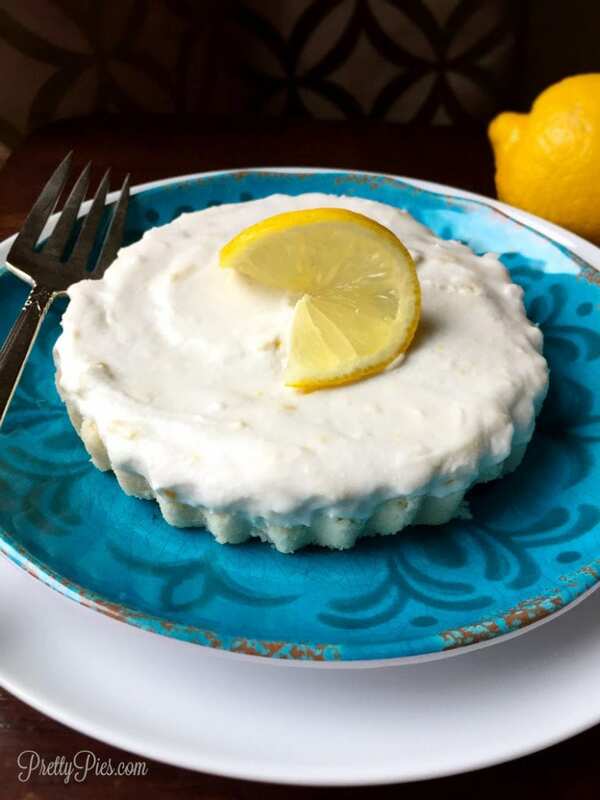 If you make this Easy Lemon Pie, I’d love to hear what you think! Emily Spain is a mom of two littles, wife and creator of PrettyPies.com— delicious desserts: pretty from the inside out. She’s a whole-food fanatic, coconut lover, and veggie-hiding ninja. You can follow her on Facebook, Instagram and Pinterest. 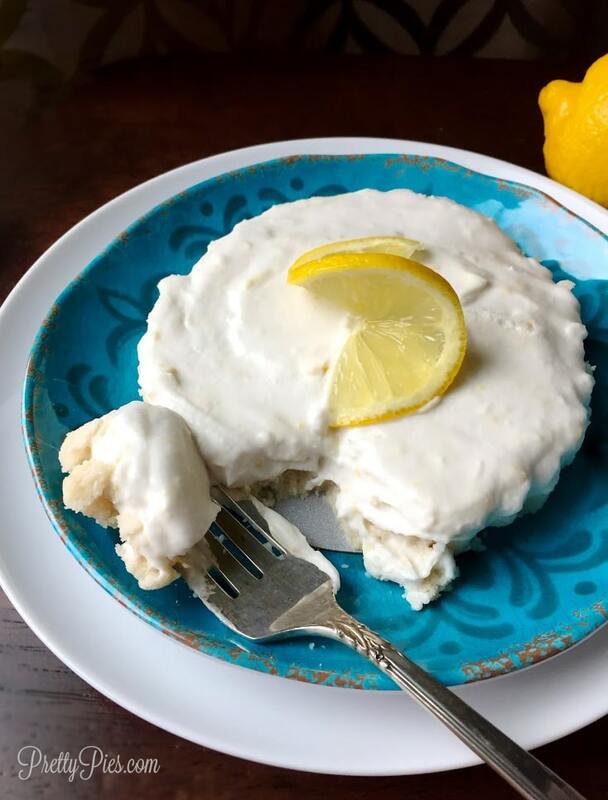 Your new favorite quick lemon dessert! It’s important to use a can of full-fat coconut milk that has been chilled overnight. Lite coconut milk or coconut milk beverage from a box will not work. When the can is refrigerated, the cream separates and hardens. Carefully scoop out only the solid white cream, but save the leftover water for a smoothie! Keep refrigerated. Should last 5-7 days in the fridge. My husband loves lemon. Will definitely try this. I don't have coconut flour can I substitute? How about trying almond flour? 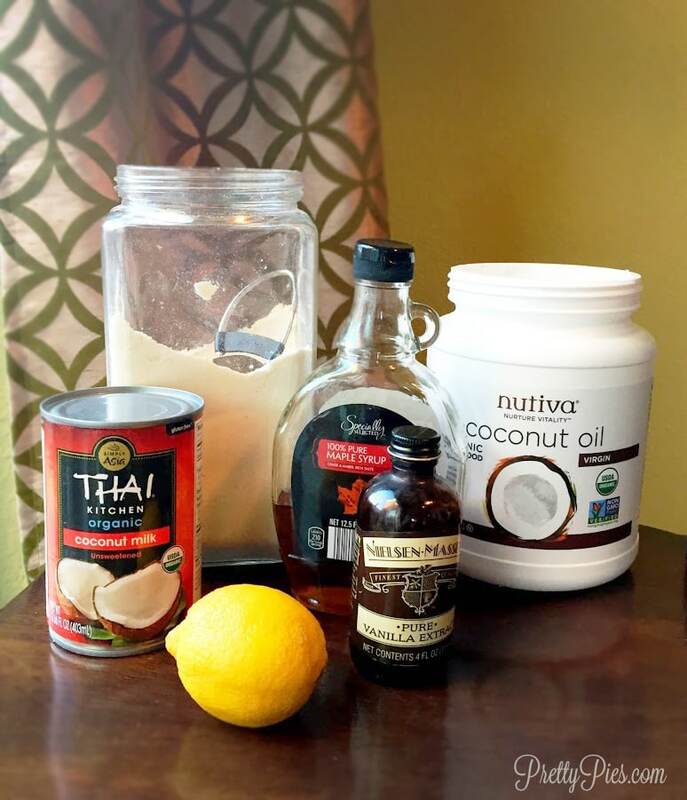 Can I use heavy cream instead of coconut cream? Mine turned out absolutely terrible, i threw it all out. I've made plenty of pies/cakes that were vegan and using all these ingredients and they've all worked fine. Something's not right???!!! I have a jar of coconut cream...should be able to use that, right? How much would I use? Not sure the amount, but that should work.